After capturing a Pokémon, depending on how well your capture went, you will get numerous rewards. These include boosts to the experience you would have gained from battle as well as various items. Excellent Throw - Gives a bonus if the ball hit within the circle and gained an "Excellent"
Great Throw - Gives a bonus if the ball hit within the circle and gained a "Great"
Nice Throw - Gives a bonus if the ball hit within the circle and gained a "Nice"
These rewards apply to both Pokémon you capture in the wild, and even Pokémon you have transferred from Pokémon GO in the Pokémon GO Park. Items are the major bonus for Catch Rewards. Here is where you find the most berries, and most importantly, Candy, for raising your Pokémon's stats. Like the EXP Bonuses, this also carries over to GO Park. The rewards you get vary on a number of factors. First, the items you receive are more common if you have done a good job capturing the Pokémon and received many Bonus Multipliers. Next, the quality of items actually increases based on the total amount of Pokémon you have caught. 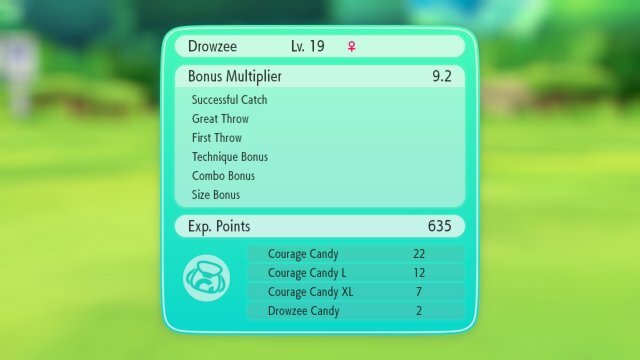 Finally, the higher the Catch Combo of the Pokémon, the more likely it is for you to find Candy rather than Berries. Regular Candy unlocks after 30 Pokémon have been caught. Candy L unlocks after 60 Pokémon have been caught. Candy XL unlocks when 90 Pokémon have been caught and Species Candy unlocks when 120 Pokémon have been caught. In addition to this, you're more likely to get Candy when catching higher levelled Pokémon.